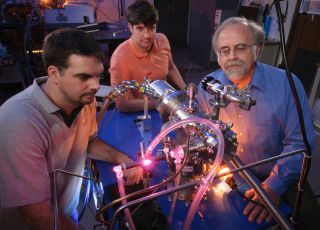 Left to right: NASA Ames scientists Michael Nuevo, Christopher Materese and Scott Sandford reproduced key components of RNA and DNA in a laboratory. Many of the chemical ingredients necessary for life as we know it were available on the early Earth, and should be present on exoplanets as well, new research suggests. Researchers at NASA's Ames Research Center in California generated three key components of RNA (ribonucleic acid) and DNA (deoxyribonucleic acid) in the lab, by exposing commonly occurring ring-shaped molecules of carbon and nitrogen to radiation under spacelike conditions. Sandford and his colleagues worked with pyrimidine, a ring-shaped molecule often found in meteorites. The rings hold carbon atoms, but the presence of nitrogen makes pyrimidine less stable than other carbon-rich compounds, researchers said. As a result, pyrimidine is easily destroyed by radiation, which is prevalent in interstellar space. "We wanted to test whether pyrimidine can survive in space, and whether it can undergo reactions that turn it into a more complicated organic species," Sandford said in the same statement. Pyrimidine is a ring-shaped molecule composed of carbon and nitrogen. It serves as the central strucutre for uracil, cytosine, and thymine, all key components of RNA and DNA. Pyrimidine should be vulnerable to destruction when traveling through the universe as a gas. But the researchers reasoned that some molecules might be able to survive if they find their way into interstellar clouds of dust and gas. Such clouds could serve as a shield, absorbing much of the radiation on the outer edges and keeping it from reaching the interior. Safe inside the clouds, the pyrimidine molecules would freeze onto dust grains, which might allow them to survive any radiation to which they would later be exposed. To test their idea, the scientists exposed an ice sample containing pyrimidine to ultraviolet radiation in a vacuum at temperatures as low as minus 440 degrees Fahrenheit (minus 262 degrees Celsius) —conditions similar to those experienced in interstellar space. When frozen in ice consisting mainly of water, but also containing ammonia, methanol or methane, the pyrimidine was much less vulnerable to radiation than it would be as a free-floating gas. Instead of destroying the molecules, the radiation transformed it into new species, including uracil, cytosine and thymine — three of the "nucleobases" that make up DNA and RNA. "We are trying to address the mechanisms in space that are forming these molecules," Ames researcher Christopher Materese said. "Considering what we produced in the laboratory, the chemistry of ice exposed to ultraviolet radiation may be an important linking step between what goes on in space and what fell to Earth early in its development." Although scientists know that pyrimidine is found in meteorites, they are still uncertain about its ultimate origins. Like the more stable, carbon-rich polycyclic aromatic hydrocarbons (PAHs), considered as potential material to kick-start life, pyrimidine may be produced by the dying breaths of red-giant stars or in clouds of interstellar gas and dust, researchers said.